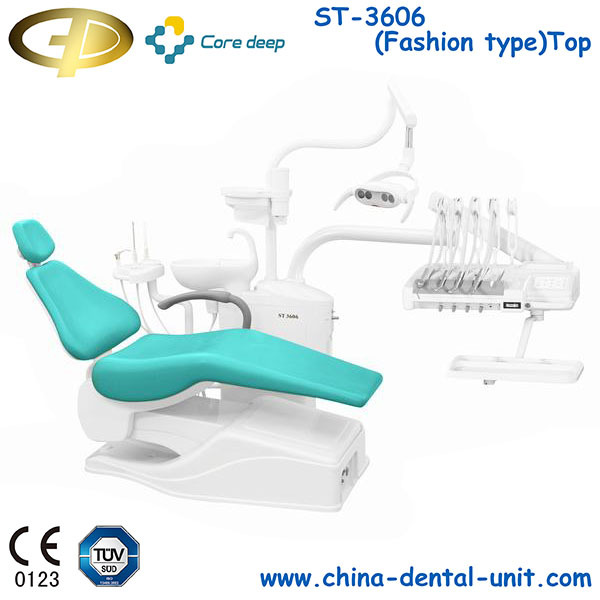 Foshan Dental Chair ST-3606 Fashion Top Mounted-Dental unit Dental Equipment Foshan Golden Promise Import & Export Co., Ltd.
Foshan Dental Chair ST- 3606T (Fashion type)Top mounted dental chair china combine the unit box and floor box, grounded unit box makes the whole chair more stable. Excepting for the excellent performance of basic functions, improved positioning memory function and patient chair offer you a convenient practice and the patient more comfort. 1.Patient chair with horizontal shift by 12mm offers patient more comfort when backrest is moving. 3.Backrest with fast movement function, enables its movement from 0 degree position to 90 degree position with 9 seconds. 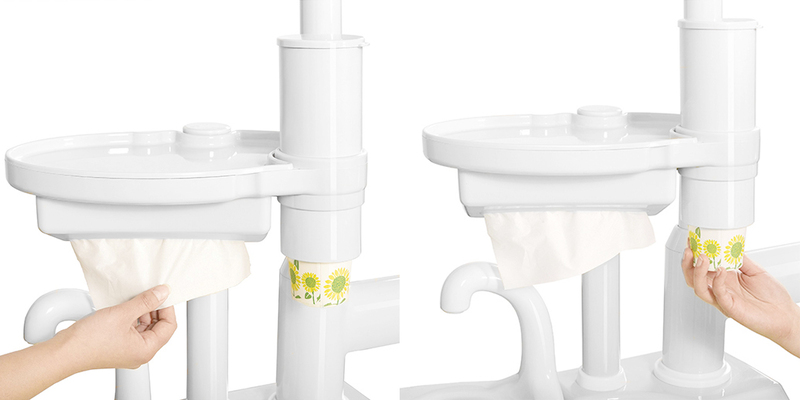 4.One touch for 3 functions: chair movement, bowl rinse and operation light. 5.2 preset positions simplify the treatment. 6.9 programmable positions make the treatment smoothly and practically. 7.Last memory position allows patient chair back to the previous treatment position easily. 8.Integrated floor box with chair base, no cables on the floor, hygienic and clean. 9.Supper low position reaches 380mm. 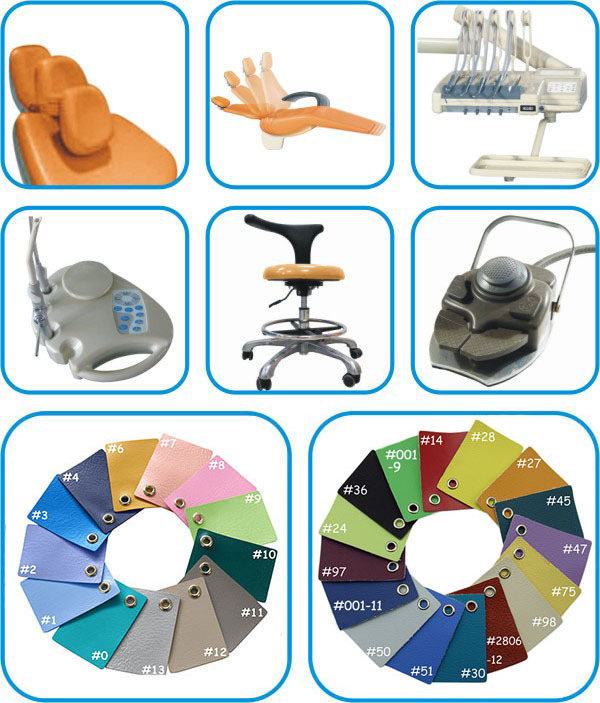 10.Control panel on instrument tray is multi-functional for all the applications of the dental unit. 11.Silicon mat of the tray could be taken out for sterilization. 12.Air brake on instrument tray ensures safe operation. 13.Innovated suction filter benefits for easy cleaning. 14.Improved assistant holder integral with suction filter and touchpad. 15.Integrated private tray, cup cartridge and tissue box provides patients with care and comfort. LED operation light benefits for precise light head positioning and better viewing.